Chimerica performed at MTC in Winnipeg. Photo by Dylan Hewlett. 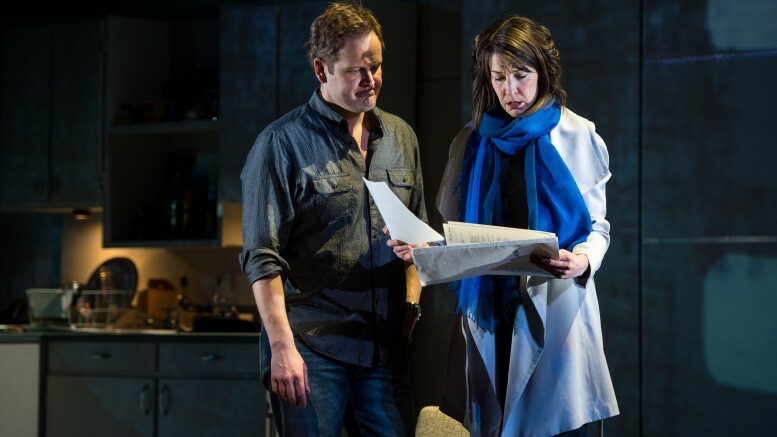 Chimerica, by British playwright Lucy Kirkwood, opened on the John Hirsch Mainstage of the Royal Manitoba Theatre Centre (MTC) Feb. 26 and will run to Mar. 19. The 2013 play is being co-produced by the Royal MTC and production company Canadian Stage, and is sure to provide a gripping, edgy experience for its audience. Chimerica – the title of which is a portmanteau of China and America – is a tense and scrupulous look into the complexities of the changing fortunes between the two countries, and their subsequently “tied fates.” The play highlights these political themes in a dramatic, and occasionally funny manner. The play is centered on a fictional story about the famous “tank man” images that were captured a day after hundreds of protesters were massacred during demonstrations in China’s Tiananmen Square in 1989. The man depicted in the photos stood in the path of an advancing column of tanks, moving from side to side to prevent them from skirting around him. Eventually a small crowd of people grabbed him and pulled him away. The identity and fate of the “tank man” is unknown. Chimerica is set two decades after this event. In the play, a fictional photojournalist who snapped the photo – Joe Schofield – receives information that the photo’s subject is alive. This launches his thrilling hunt to find the unknown tank man. Evan Buliung plays the role of Schofield, and he believes the piece’s political subject matter is still relevant to what’s going in the world today, specifically within China and America themselves. “[Chimerica] is about two countries that work through the culture of fear and repression,” Buliung told the Manitoban. Playing Joe Schofield comes easily for Buliung, as he is able to relate to the character’s work-oriented nature and fondness for witty, offhand expressions. Buliung added that many people will be able to relate to the play’s characters and themes. “It is a political play but it also has a great storyline of friendship, love, and loss. We all relate to that. There are a lot of universal themes in it,” said Buliung. Chris Abraham – the artistic director for Toronto’s Crow’s Theatre – is directing the play. For him, the geopolitical overtones in Chimerica are familiar waters. In the past, Abraham has directed productions such as For the Pleasure of Seeing Her Again and The Little Years, which had similarly complex themes to Chimerica. “I tend to gravitate towards work that deals with complex subjects – be it scientific or political,” said Abraham. Given the complex nature of the production, it was important for Abraham to carefully pick his cast. He believes it’s important for Canadian stages to be creatively inclusive. “I know that across the country, all leaders in cultural fields are looking for ways to recreate a more creatively inclusive expression of our country on our stages,” Abraham explained. The tank man photos highlight the powerful effect an art piece can have on our world. With the advent of social media, a photograph can now go viral in a very short time, and powerful messages can be passed along that can in turn spark drastic change. “The viral phenomenon of photographs circulated through social media and how those photographs can change behaviours as opposed to lame mainstream press has really changed,” said Abraham. All in all, Abraham just wants audiences to go in prepared to have their minds blown by Chimerica’s compelling story.